Step 1: Start the thread and attach the lead eyes directly behind the eye of the hook. This will help the fly stand up higher in the water. Step 2: Attach the chenille as shown. I like to tie it in right behind the eyes to help bulk up the body later. 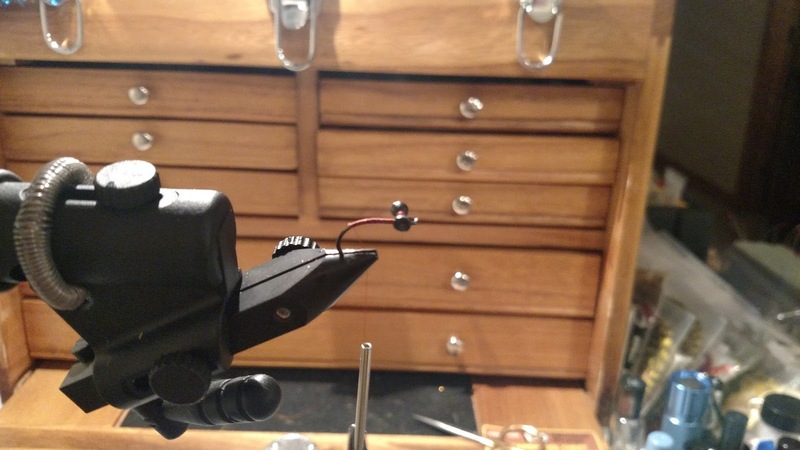 Allow roughly an inch to hang off the back of the hook to act as the worm tail. 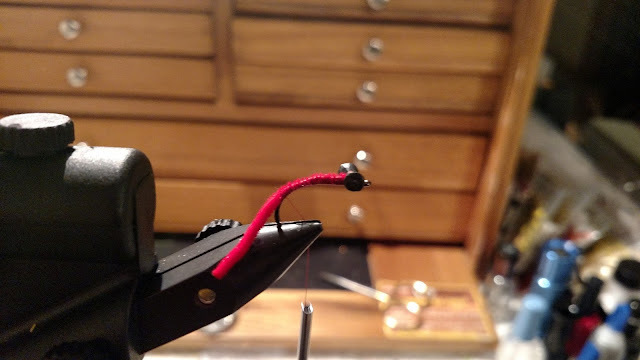 Step 3: Take 3 or 4 strands of peacock herl and attach them to the hook right where the last thread wraps are holding the worm chenille. Step 4: Wrap the pieces of peacock herl up the shank of the hook tightly one right after another. 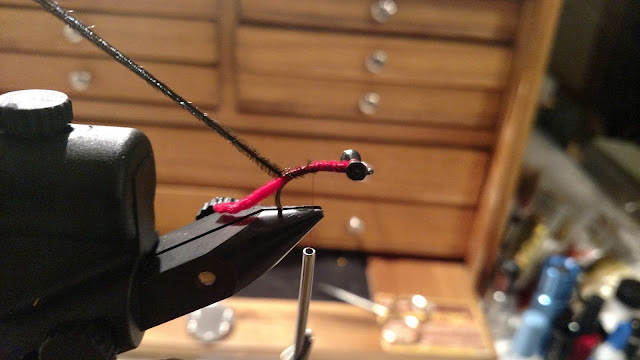 Tie them off and snip them right behind the lead eyes. 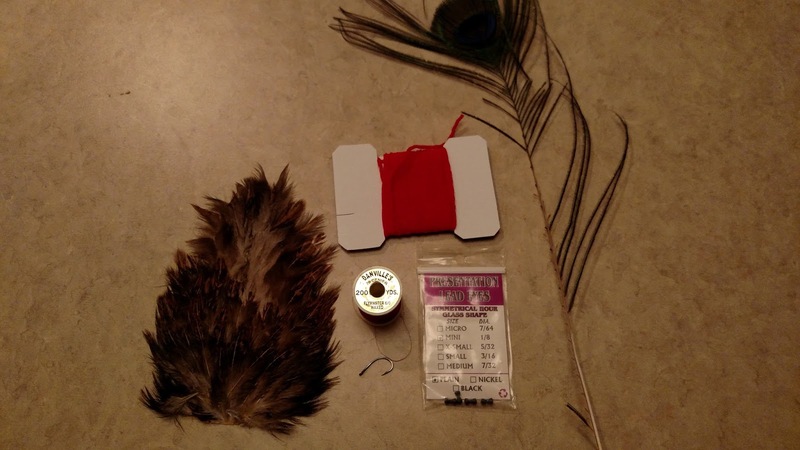 Step 5: Pull a feather from the Indian hen cape. 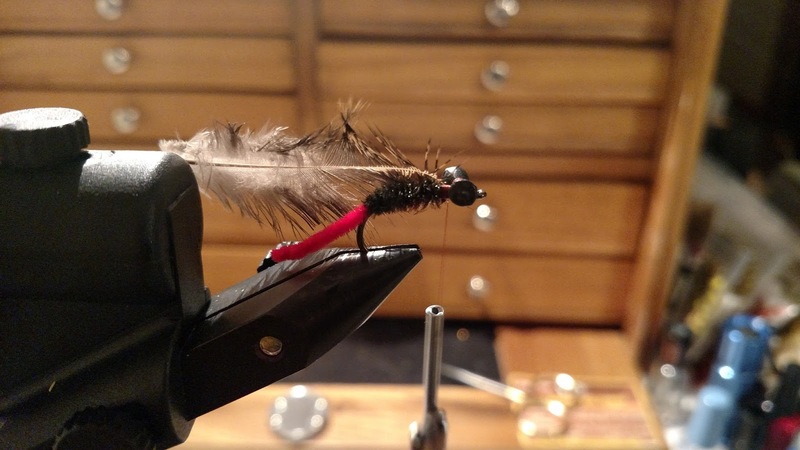 I like to prepare the feather as shown to help me tie it in more cleanly. This type of tie in is often referred to as tying in the feather “soft hackle style”. Step 6: Tie in the feather directly behind the eyes as shown. 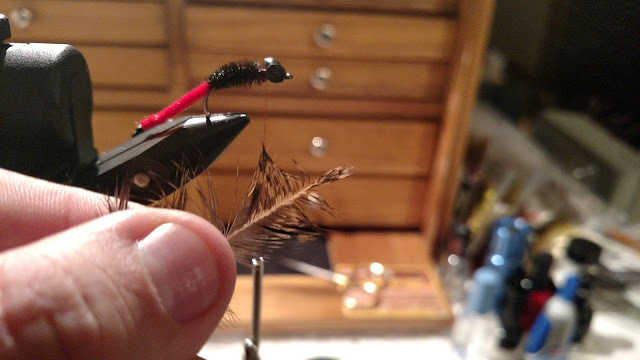 You are basically tying it in right on top of where you clipped the peacock herl. Step 7: Palmer the feather around the hook shank behind the eyes 3 or 4 times. Tie it off behind the eyes and stroke the fibers back and wrap in front of them several times. This will help them lay back against the fly. Step 8: Jump your thread in front of the eyes and whip finish and snip off the thread. 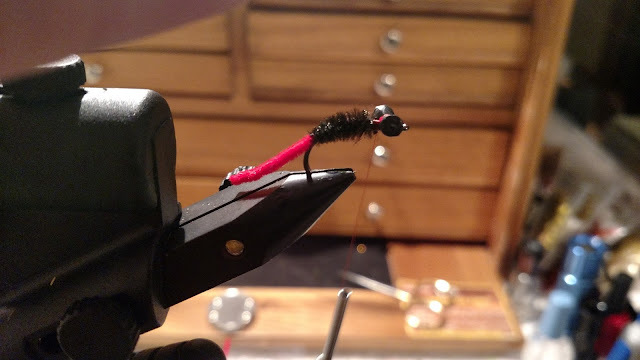 Step 9: This is an optional step but I think it makes the fly look better. Take a lighter and quickly poke the worm tail into the flame and remove it from the flame. This will taper the tail down smoothly. MAKE SURE TO DO THIS QUICKLY, that way you don’t mess up and catch the chenille on fire. 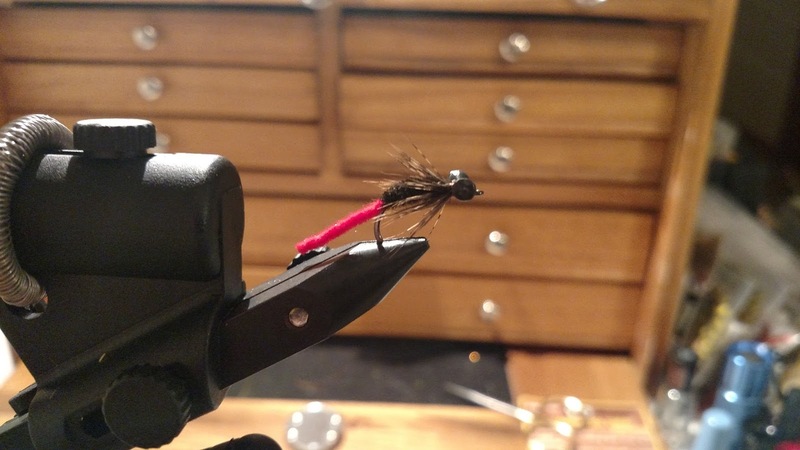 That’s the finished fly! The original pattern was designed by John Montana and he designed it solely for the purpose of fooling big carp. 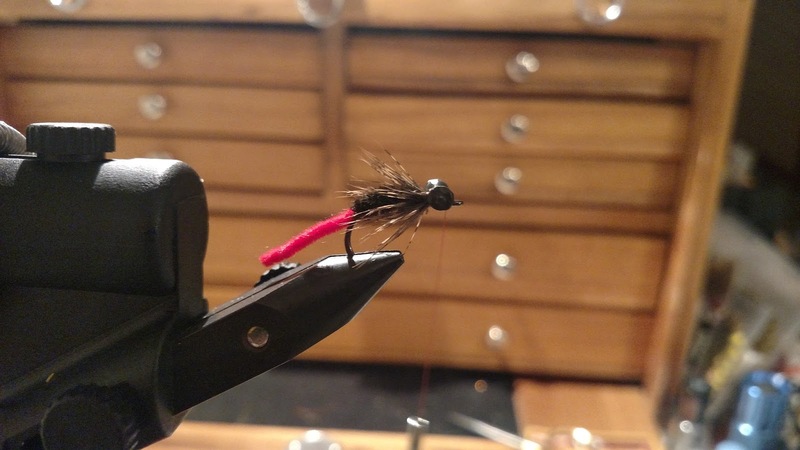 I mainly use this fly for what it was intended and due to its size, even the spookiest of carp can usually be coaxed into sipping this pattern in. 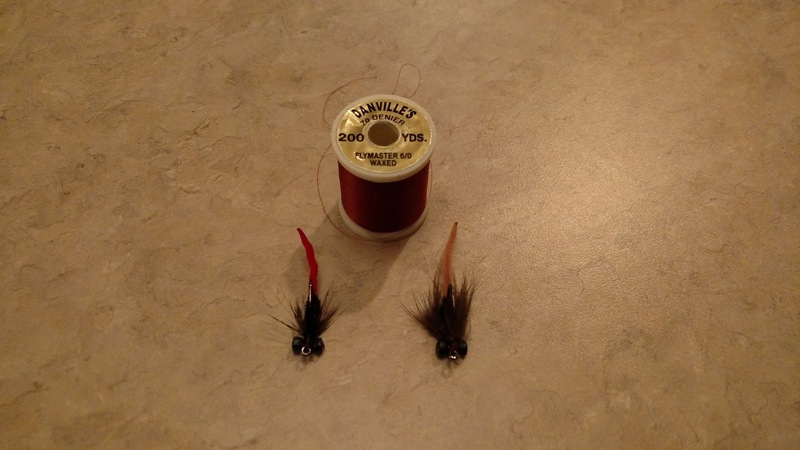 You can tie this fly thin without too many hackle wraps like the one on the left or you can add a few more hackle wraps to really bulk up the body like the one on the right. 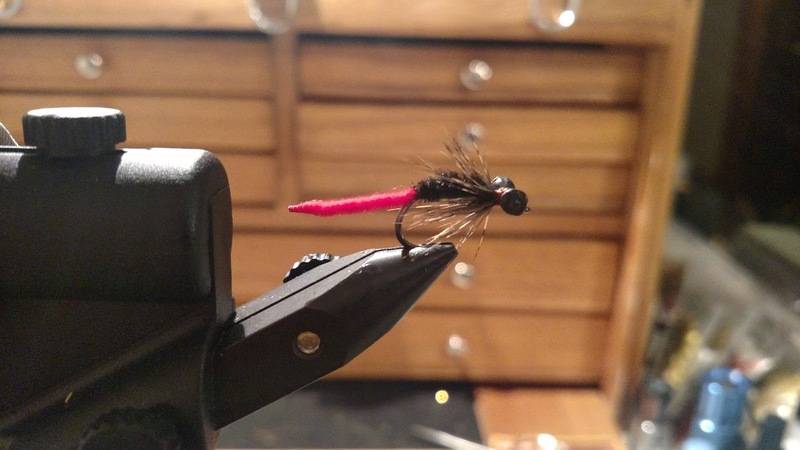 I tie it in a few colors but my most successful have been red and a natural tan. This fly has been responsible for landing smallmouth, largemouth and sunfish species for me as well.